AC motors can be divided into two main categories - (i) Synchronous motor and (ii) Asynchronous motor. An asynchronous motor is popularly called as Induction motor. Both the types are quite different from each other. Major differences between a synchronous motor and an induction motor are discussed below. Synchronous motor: Stator has axial slots which consist stator winding wound for a specific number of poles. Generally a salient pole rotor is used on which rotor winding is mounted. Rotor winding is fed with a DC supply with the help of slip rings. A rotor with permanent magnets can also be used. Induction motor: Stator winding is similar to that of a synchronous motor. It is wound for a specific number of poles. 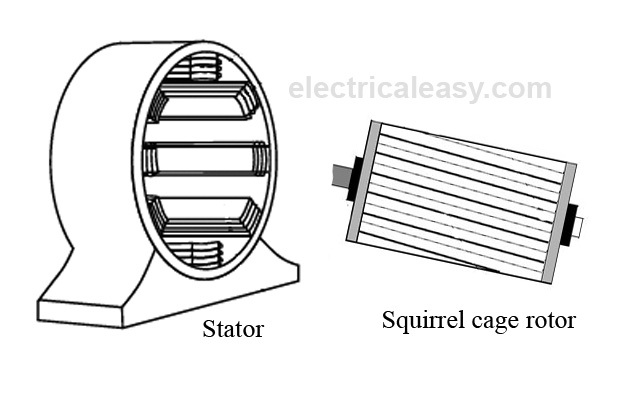 A squirrel cage rotor or a wound rotor can be used. 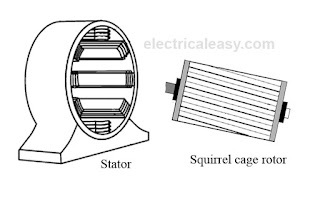 In squirrel cage rotor, the rotor bars are permanently short-circuited with end rings. In wound rotor, windings are also permanently short-circuited, hence no slip rings are required. Synchronous motor: Stator poles rotate at the synchronous speed (Ns) when fed with a three phase supply. The rotor is fed with a DC supply. The rotor needs to be rotated at a speed near to the synchronous speed during starting. If done so, the rotor poles get magnetically coupled with the rotating stator poles, and thus the rotor starts rotating at the synchronous speed. Synchronous motor always runs at a speed equal to its synchronous speed. Learn more about working of a synchronous motor here. Induction motor: When the stator is fed with two or three phase AC supply, a Rotating Magnetic Field (RMF) is produced. 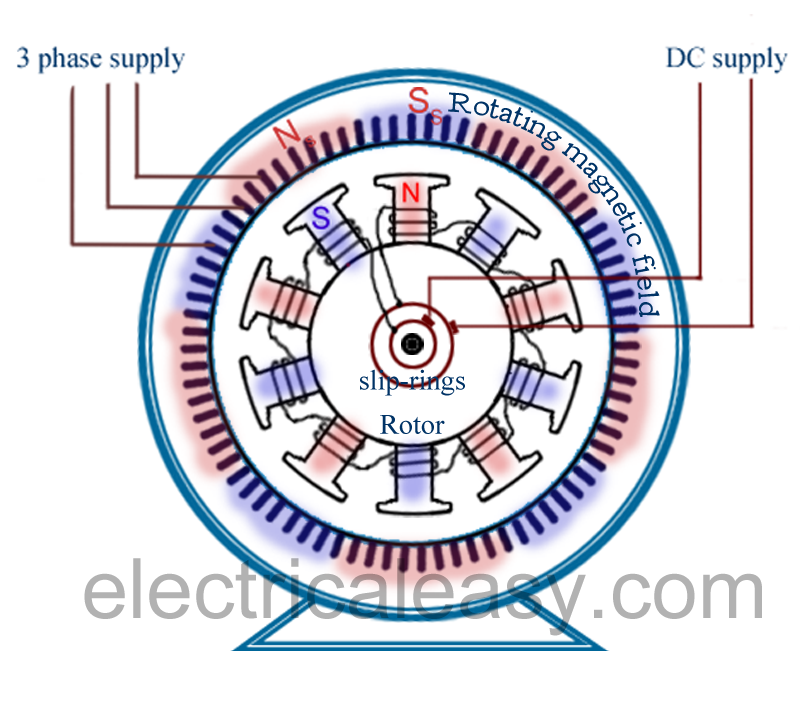 The relative speed between stator's rotating magnetic field and the rotor will cause an induced current in the rotor conductors. The rotor current gives rise to the rotor flux. According to Lenz's law, the direction of this induced current is such that it will tend to oppose the cause of its production, i.e. relative speed between stator's RMF and the rotor. Thus, the rotor will try to catch up with the RMF and reduce the relative speed. Induction motor always runs at a speed which is less than the synchronous speed. Learn more about working of induction motor here. Synchronous motors require an additional DC power source for energizing rotor winding. Induction motors do not require any additional power source. Slip rings and brushes are required in synchronous motors, but not in Induction motors (except wound type induction motor in which slip ring motors are used to add external resistance to the rotor winding). Synchronous motors require additional starting mechanism to initially rotate the rotor near to the synchronous speed. No starting mechanism is required in induction motors. The power factor of a synchronous motor can be adjusted to lagging, unity or leading by varying the excitation, whereas, an induction motor always runs at lagging power factor. Synchronous motors are generally more efficient than induction motors.